For a long time now, the Empire has worked on a way to stamp out the last vestiges of Serb freedom in the occupied province of Kosovo (declared "independent" by its Albanian government in February 2008, with Imperial support). They put the plan into effect this week. The pathetic quisling regime in Serbia - which has been doing everything in its power to implicitly recognize the "Kosovian" government without overtly doing so - responded by mewling about "diplomatic solutions" and "negotiations" with KFOR, EULEX and other Imperial institutions put into place to help the KLA regime carve out Kosovo. Not surprisingly, the Imperial envoy Peter Feith endorsed the Albanians' actions, saying that every sovereign state has a right to control its territory. Except Serbia, of course, because rules do not apply in her case. According to reports from the province, Albanian special forces were beaten back from the two checkpoints at the "border", with one casualty. KFOR, commanded by a German general, is helping the Albanian "police" occupy the checkpoints. EULEX is silent. Russia is demanding an urgent, closed session of the UN Security Council. Belgrade is rolling over and playing dead. But the Serbs in Kosovo don't give a rotten rodent's posterior for the regime currently running Serbia - they are fighting for their survival with everything they have. In the rest of Serbia, there are rumors of protest marches, which the government has banned. God forbid anyone resists the Empire! All the mainstream media are toeing the government line, so the public is rapidly turning to Facebook, Twitter and blogs to find out what is going on. Yesterday evening Moscow time, I commented on the situation for RT. What puzzled me was the presenter's seeming belief that this was an issue that "Serbia and Kosovo" would have to resolve in order to get into the EU. Far as I know, Russia refuses to recognize the self-proclaimed Albanian state. And this is much more than a border dispute - it's an attempt to snuff out Serb presence in the province altogether, under the guise of "law and order." What law? What order? By rights, it is Serbia that ought to be establishing its sovereignty over the occupied province, instead of Hashim Thaci's mafia clan posing as government. Of course, President Tadic has already said his government would not fight. In any case, Serbia's military is busy taking part in NATO's exercises in Ukraine (and just who might those be aimed at? Venezuela?). Yet he and his regime are quickly being rendered irrelevant. The KLA/Imperial takeover was thwarted by the local Serbs, who seem to have preserved both their courage and their convictions. Had the Albanians waited just a few months more, the spineless slugs in Belgrade would have given them their recognition. By launching this idiotic adventure, they may have ensured the fall of Tadic, and the end of Imperial control over Serbia. To say that something "isn't quite right" about Anders Behring Breivik, the Norwegian (allegedly) behind the Utøya massacre on Friday, would be an understatement. Yet it is true in more ways than one. According to the police, Breivik detonated a car bomb in front of the government building in Oslo as a diversion, then infiltrated a summer camp for the ruling party's children on the island of Utøya, and opened fire. Initial reports put the combined death toll of the bombing and the shooting spree at 93, which have since been revised to around 70. Much is being made of Breivik's Facebook, Twitter and blog posts - all very recent - and the manifesto (CNN) he allegedly worked from. They almost read as a list of talking points of the diversity-obsessed multi-culturalists, wishing to discredit their critics. Charlie Brooker rightly found it terrible that the media "experts" rushed to judgment and blamed the Muslims. Given the jihadist proclivity for terrorism, that wasn't an entirely outlandish conjecture; the problem was that it posed as certainty. I'm not sure anyone will dare speak up in a similar manner against a rising tendency to smear all the traditionalists, conservatives, and opponents of totalitarian welfare-statism and unrestricted immigration as murderous fanatics. It will again be a conjecture posing as certainty, only even less grounded in fact. Breivik is shocking precisely because he is a glaring exception to the rule. Surely, his fanaticism can hardly compare to that of people who believe the best way to ensure diversity of appearance (a goal asserted to be good without explanation) is the ironclad uniformity of thought? Those looking for sympathy for Breivik will find none here. He's a murderer. How can fighting for the future of one's nation - Breivik's declared goal, if the papers are to be believed - mean murdering that nation's children? An absurdity, if ever there was one. Nor do I want to get into arguments over which of his convictions were grounded in reality; I've been saying for years that actions and beliefs ought to be judged on their own inherent merits, or lack thereof, rather than on the basis of who claims association with them. I do, however, wish to address one particular aspect of Breivik's alleged motivation, which is getting more and more play in the Western press. According to CNN, his manifesto suggests that he was driven to action by Norway's involvement in the 1999 Kosovo war, directed against "our Serbian brothers (who) wanted to drive Islam out by deporting the Albanian Muslims back to Albania." Next thing you know, the media will declare, "The Serbs made him do it." Worked for that kid in Salt Lake City, did it not? Let me clarify, then. If Breivik saw the 1999 war in the way described above, he was factually wrong. While Islam is a powerful factor that has shaped and driven Albanian chauvinism for over a century (and certainly underpins the destructive rage against the Serbian Orthodox churches), the Albanian regime controlling Kosovo today systematically oppresses not only the remaining Serbs, but also the Gorani - Muslims by faith, Serbs by language - which indicates that its bigotry is ethno-cultural as well as religious. If anything, it was NATO - and the U.S. - who saw the war in terms of helping the "good Muslims" against the evil Orthodox Serbs. The Serbian government fought to defeat a terrorist insurgency seeking to make Kosovo part of an enlarged Albanian state. There was no plan of persecution and deportation - unless one believes the sordid German fiction called "Operation Horseshoe". Serbia is actually the most multi-ethnic Yugoslav successor state, and home to a substantial Muslim population. These days, Belgrade is entirely too tolerant of a militant Muslim cleric who seeks to foment a rebellion in its southwestern parts. 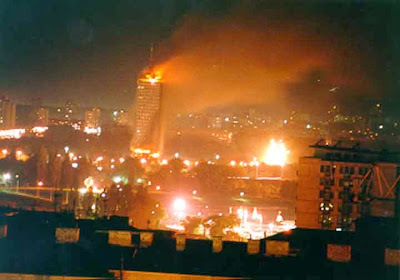 To argue that Serbia sought to expel the Albanians in 1999 due to their Muslim faith is to accept NATO's excuse for the bombing. That claim was wrong then, and it is wrong now. Furthermore, over the past two decades of vilest demonization in the Western media - worse by far than the cartoon depictions of Muslims over which there have been riots, death threats and even murders - as well as not one, but two bombing campaigns, there has not been a single Serbian terrorist attack in the West. Not one. As a result of Imperial meddling, Serb populations in today's Croatia, large parts of Bosnia and Kosovo have become extinct, yet no Serb has ever resorted to terrorism against NATO countries. Let alone shot up a summer camp full of children. No cause can justify the murder of innocents, whether it is purportedly a struggle against the loss of national identity (as Breivik claims), or bringing democracy (as the Empire and its allies have claimed) to Iraq, Afghanistan, Libya - or for that matter, Kosovo. Sadly, neither Breivik nor those who will sit in his judgment seem to understand that simple fact.